It must be August, because my office phone has been lighting up with calls from farmland owners wanting to know about the direction of cash rent values for lands here in east-central Illinois. This is never easy to answer, because no one can accurately forecast the future. Currently at this moment with the projected above average harvest of field corn and soybean, and the continuing trade disputes with our major foreign grain buyers, the outlook for cash grain income is not as "rosy" as it was 4 months ago. 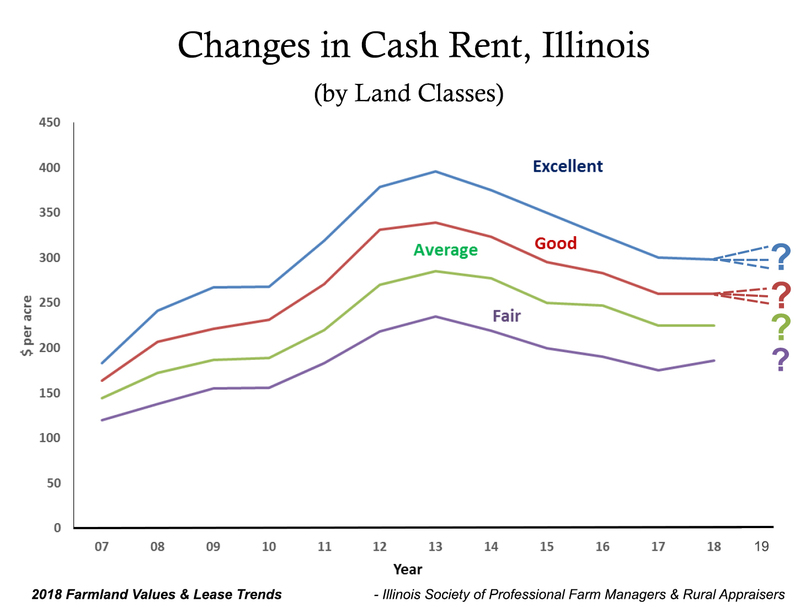 With all this uncertainty in the marketplace, farmland owners and operators may want to shift from the more traditional cash rent farmland lease to either a flexible cash rent lease or a hybrid of these two, the "base rent + bonus" cash rent type of lease. 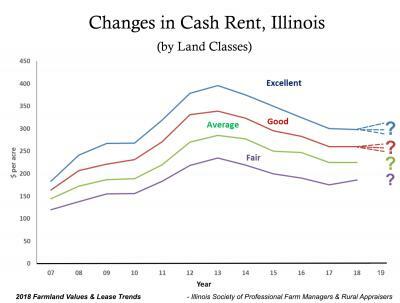 These types of leases allow for increasing cash rent if cash grain incomes rise. The Iowa State University has two good publications that describe the basics of these leases as well as giving examples. "Flexible Farm Lease Agreements -- -- C2-21" and "Flexible Cash Rent Lease Examples -- C2-22" are both available from their website and include a "flexible cash rent" analyzer where you can analyze different yield and price scenarios to come up with an equitable lease for both parties. The University of Illinois "farmdoc" has fillable cash rent lease forms that can be used for either straight cash rent or a flexible type of rent. Short fact sheets on the each of the various farmland lease types can be found on the "farmdoc" Management page under "Farm Leasing Fact Sheets". Additionally, "farmdoc" in its FAST Tools section under the Farm Management heading has a Farmland Lease Analysis and Cash Rent with Bonus calculators that are available.